40 Days for Life Fall Prayer Campaign is back and OCLife will be serving a molieben in front of the Planned Parenthood on Georgetown Rd, Indianapolis on Saturday October 28th at 10:30 am. A silent prayer vigil at 9:30 am will precede the molieben. Please join us and make a difference in upholding the sanctity of life. 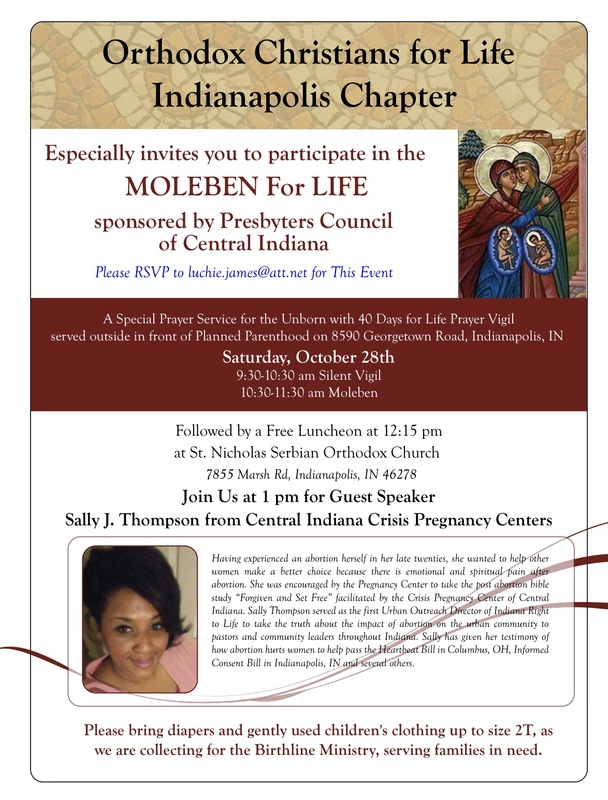 We will have a free luncheon at 12:15 pm at St Nicholas Orthodox Church on 7855 Marsh Rd, Indianapolis, with our guest speaker, Ms. Sally Thompson from the Central Indiana Crisis Pregnancy Center. Hope to see you then! May God bless this event for His glory.